IBIS is pleased to announced a first sale of its flagship Smart-binder system to the United Arab Emirates (UAE) in the Middle East. 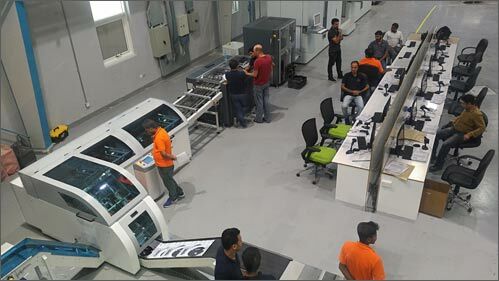 Dynagraph, our sales agent in the Middle East for in-line and near-line systems with Tecnau web cutters, working in partnership with Canon, has sold a Smart-binder SB-2 to United Printing Press in Abu Dhabi, UAE. This Smart-binder is running in-line with a Canon ColorStream printer to produce examination papers, and is used to meet a demanding production schedule. "Dynagraph is proud to be IBIS partner in the Middle East, this partnership has been proven right by succeeding together in a very challenging project of UAE exam paper production for United Printing Publishing, the challenges and most importantly the delivery schedule could only be met through an excellent partnership with IBIS and the supply of the reliable SB-2 machine"
The Smart-binder models SB-2 and SB-3 are the state-of-the-art high-speed wire-stitching OR ISG cold-gluing systems (SB-3 only) for personalized booklets from four to two hundred pages. The Smart-binder is the ideal finishing system for continuous high-speed inkjet environments and continues to be the world leader in its market segment.